Life from single molecules to entire populations takes place in four dimensions. Three of which are spatial dimensions and last, but not least, the dimension of time. Interestingly, researchers ignored these hard realities for quite some time. During my PhD project on translational regulation within cells, we would like to master the four dimensions as good as we can. Live-cell imaging is a good method to monitor a single cell over time and to observe what is changing. However, live-cell imaging requires sharp and crisp images in order to be able to track single molecules over longer time spans. The biggest problem with conventional light microscopes are in fact the three spatial dimensions (x, y, z), because all the light from the specimen that you are observing is collected. This means not only the light of a single plane (x,y dimensions) is collected (and later observed), but also the light originating from all other planes above or below (z dimension) (see also Figure 1). Collecting a lot of this so-called “out of focus” light leads to blurred pictures, which means that fine details cannot be distinguished from each other anymore. A powerful tool to circumvent this problem is a variation of classical light microscopy called CONFOCAL MICROSCOPY. Here, I would like to give a short introduction into this extremely powerful and widely used microscope technique. 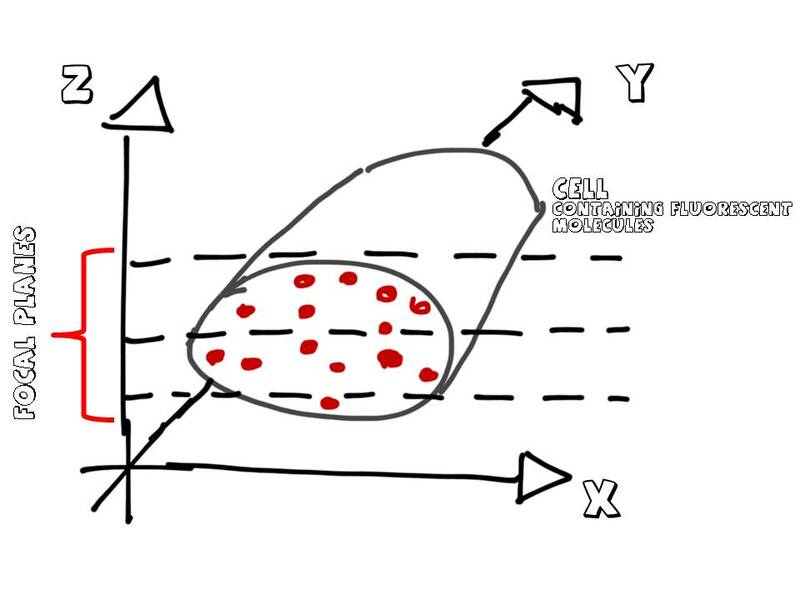 Figure 1: A cell that is observed under a microscope has three dimensions (x, y, z). However, the optics of a microscope dictate that only one z-plane can be “in focus” and not all planes at the same time. A standard microscope collects the light of all planes and therefore often produces blurred images when larger objects such as cells are observed. In order to make sense of the confocal technique (con-focal = “having the same focus”) I would like to draw your attention to Figure 2. With the help of the steps 1 to 5 I will guide you through the figure. First of all a confocal microscope needs a strong light source. This role is often fulfilled by a short-wavelength laser (Step 1). 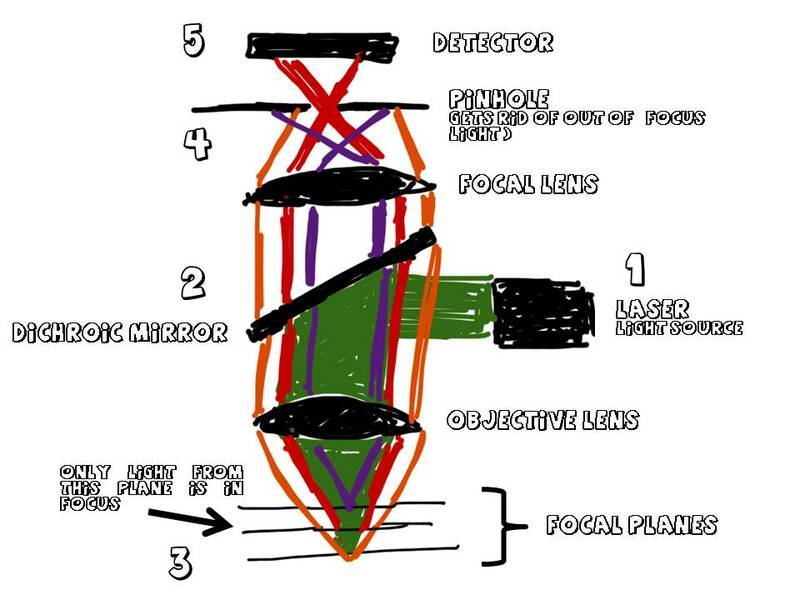 The laser light is then reflected in a 45° angle by a so-called dichroic mirror (Step 2). This special mirror reflects short wavelengths (such as the green excitation laser), but is permissive for longer wavelengths (such as the emitted red light). The reflected green laser light is focused by the objective lens onto the specimen. Unfortunately, it is impossible to focus the light on only one single z-plane. As a consequence, a number of z-planes are excited by the green light and depending on the fluorescent molecule emit longer wavelength light, here depicted as red, orange, and purple (Step 3). Partly, this emitted light will later form the image that you can observe, but first it needs to travel to your eye: As explained above, the dichroic is permissive for the emitted longer wavelength light. Therefore, the light originating from all z-planes can pass. Since the light is originating from different planes, it also hits the so-called focal lens at different positions resulting in different focal points of this light. And now a small slit, called pinhole comes into play (Step 4): Most light (based on its origin) cannot pass this tiny opening because it is either focused in front of or behind the pinhole. The reason why a confocal microscope produces crisp images is that only light from a single z-plane is able to pass since its focal point is exactly within the pinhole (in this example the red light). Consequently, this light can reach the detector (Step 5) where it is converted into a visible image. Figure 2: The setup of a confocal microscope can be described in five simple steps (see text). The pinhole is the central element because it blocks all “out of focus” light originating from non-desired z-planes. Unfortunately, the seemingly simplistic confocal approach also has two important side effects. First of all, a lot of light is lost because it is shielded by the pinhole. This in turn requires a very strong light source which can damage the sample if applied for a long time. In order to prevent this from happening, the specimen is scanned point-for-point in the x,y dimension. This leads us to the second side effect: Scanning takes a lot of time and this is kind of impractical if you want to observe a live cell. But: Both problems can be (partly) resolved by a variation of confocal microscopy called “spinning-disc confocal microscopy”. More on this technique in my next post!